The plan for 2017 is to hustle, and to hustle hard. There’s a lot of things I’d like to achieve next year and that means a lot of extra work. Extra work on top of normal life stuff = planning, and lots of it. I used a diary for this year and, though I often have days without any plans at all, I use the pages to simply write to-do lists and notes for things that I need to remember. I’m a hugely visual person and I find it massively helps for me to get my thoughts down on paper, rather than have them as a jumble in my head. 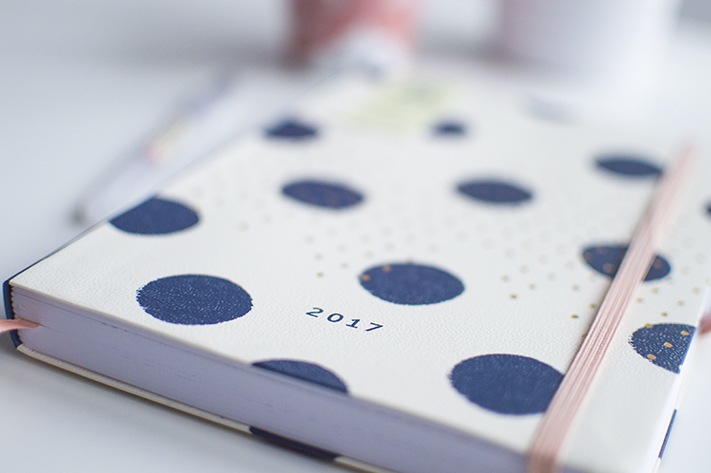 My new diary is a 2017 Day a Page Diary from a UK stationery brand called Busy B, and is certainly a thing of beauty. Gold foiling, navy, cream and a pastel pink? Yes please! Compared to my current, beaten up thing, this is a huge step up. It’s a lot sturdier, with a hardback cover and a nice elastic closure to keep it all together. It also has an elasticated pen loop on the side so you can carry it with you and not have to scramble in your bag for a pen! One of my bug-bears with most diaries is that they have plenty of space in the week, but hardly any for the weekends. Considering most of my plans happen at the weekends, it seems a bit silly to sacrifice space for the week - especially as a lot of us have day jobs and any plans we do have are just little evening jaunts. This is a day a page diary, so there’s plenty of space for every day of the week. 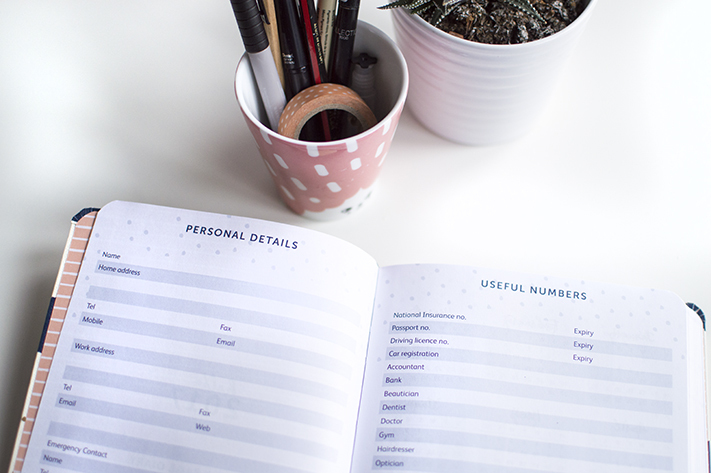 I won’t always have enough lists, notes or plans to fill an entire page but that doesn’t matter – I just love the idea of having the space to write down my scribbles and know it will all be in one place. The diary runs through from January 2017 to the 1st of January 2018, but it also has a 2018 year planner on a double page spread, as well as pages for important birthdays, useful websites and notable dates. I adore the look and style of this diary, and I suppose it seems silly that appearance can make such a difference for an object as useful as this, but I do think that the aesthetic will make me use it more! I’ve already started decorating the pages with stickers, and come the first of January I know I’ll be very proud to carry it with me and show it off! I was kindly sent the diary to review but, as always, all views and opinions are unbiased.